So currently about one out of every eight state rules are being repealed. Here’s why that’s important. State regulations have been estimated to cost the private sector in North Carolina up to $25.5 billion in a single year. Such a tremendous toll on private enterprise, especially in terms of deadweight loss, is why it is vital to ensure that state regulations are (1) carefully made, and also (2) periodically checked to see if they’re working, still needed, outdated, or more trouble than they’re worth. That’s what sunset provisions with periodic review of state rules is designed to do. Rules either sunset (get repealed) or are reviewed every 10 years. Right now, however, the process includes an allowance for regulations that agencies found necessary and that don’t attract public comment. That category encapsulates well over half of state regulations. 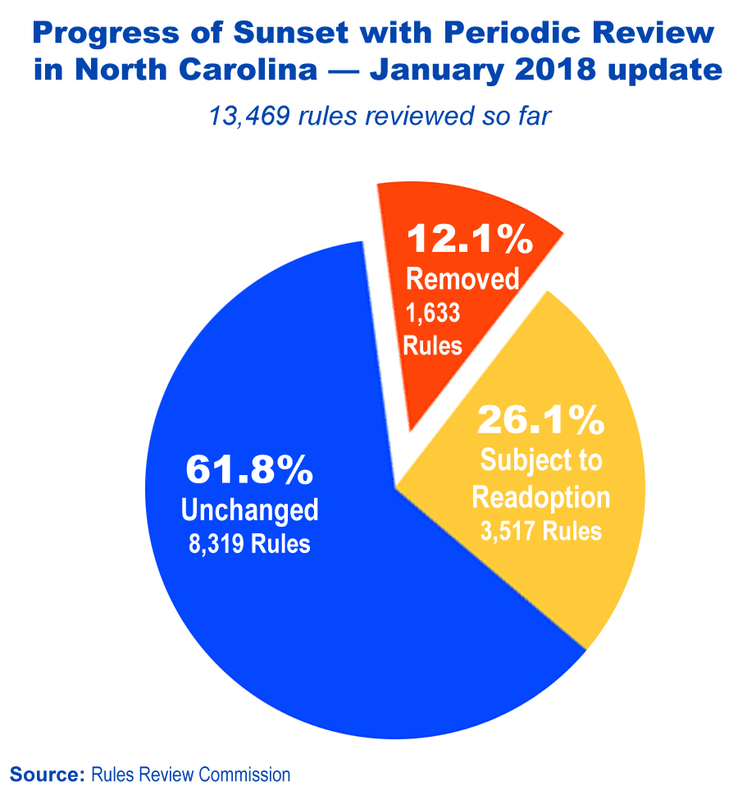 It lets them continue on without review, which means that even as the reform is doing well — one out of every eight rules is a big deal — it’s not doing as much good as it can. It’s a simple fix, and one endorsed by the chairman of the Rules Review Commission. Get rid of that provision so that all rules either sunset or get reviewed every 10 years. The House and Senate seem to agree, as both chambers passed versions of that same reform in 2017. It remains to be done in 2018.